Approved flooring assembly can automatically capture and remove liquid spilled on its surface. Thanks to an innovative manufacturer and an investigative research program conducted by FM Global Research at the Research Campus in West Glocester, Rhode Island, USA, a new FM Approved flooring assembly is now available to reduce the effects of ignitable liquid pool fires. The new Approval Standard 6090, Ignitable Liquid Drainage Floor Assemblies (released in May 2017), was developed based on the research results and test protocols produced during the research program. The new standard was used to evaluate and approve a new type of flooring assembly from Houston, Texas-based manufacturer Safespill Systems LLC. The assembly can automatically capture and remove any liquid spilled on its surface, including chemicals and ignitable liquids. Many industries use ignitable liquids, including fuels, process chemicals, hydraulic fluids, solvents, paints, coatings, adhesives, vegetable oils, waxes and polishes. Facilities that rely on ignitable liquids must balance the need to provide adequate protection for, and confinement of, ignitable liquids in case of fire with the need to freely access and move these liquids as required by production processes. Managing the hazards associated with ignitable liquids requires a comprehensive approach, including proper transportation and handling, adequate sprinkler protection and passive construction features such as isolation (containment), and drainage. Ignitable liquids containment, in particular, presents a unique challenge because of the high heat release rate of the liquids and the fact that liquids flow freely past barriers that are not leakproof. The FM Approved Safespill flooring assembly features a raised perforated aluminum decking that allows any spilled liquids to flow into a cavity below the deck and be safely removed to a separate containment tank by means of a flushing and suction system within the floor. According to Safespill founder and CEO, Tristan Mackintosh, the concept was derived from a specific type of helicopter landing pad used on some offshore oil platforms and drill ships. “Those landing pads have aluminum perforated decking to prevent pooling of spilled kerosene fuel. I realized that it was possible to design aluminum flooring profiles that are strong enough to take the weight of a jet or helicopter and still have a perforated top surface to drain away spills,” notes Mackintosh, a native of The Netherlands. Safespill determined they could utilize the engineered flooring system for commercial and industrial applications. “We began talking to some very large companies that deal with ignitable liquids and hazardous chemicals on a regular basis,” he says.  “Of course, they asked us if our product was FM Approved." An IBC filled with mineral seal oil releases its content onto the engineered floor system. The liquid quickly flows through the perforated aluminum surface and flows into the cavity below the deck where it is carried away to a remote storage container via suction pump. In 2015, Safespill joined FM Global in a joint research program to assess the capabilities and limitations of its new engineered flooring system. In 2016, a series of 39 tests were conducted on the Safespill flooring system, including drainage rate tests, survivability tests, IBC (intermediate bulk container) discharge distance tests, and storage tests of single and multiple IBCs (see figures 1, 2 and 3). 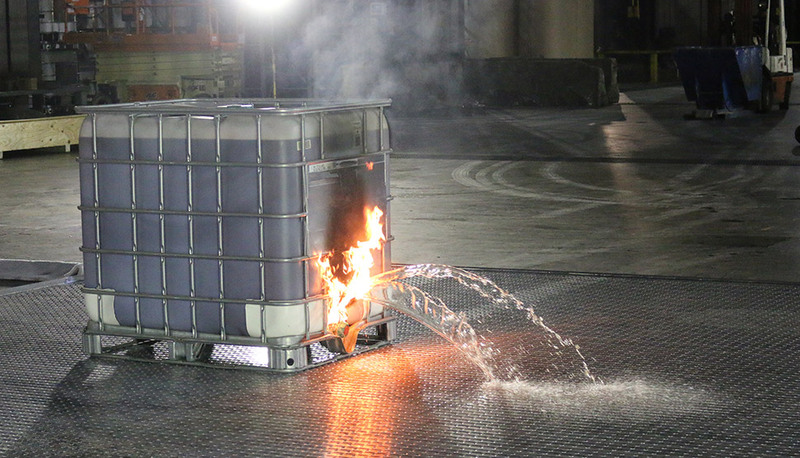 At 38 minutes into this test, the IBC is fully involved in fire; however, the spread of the pool fire is limited by the continuous drainage provided by the engineered flooring system. 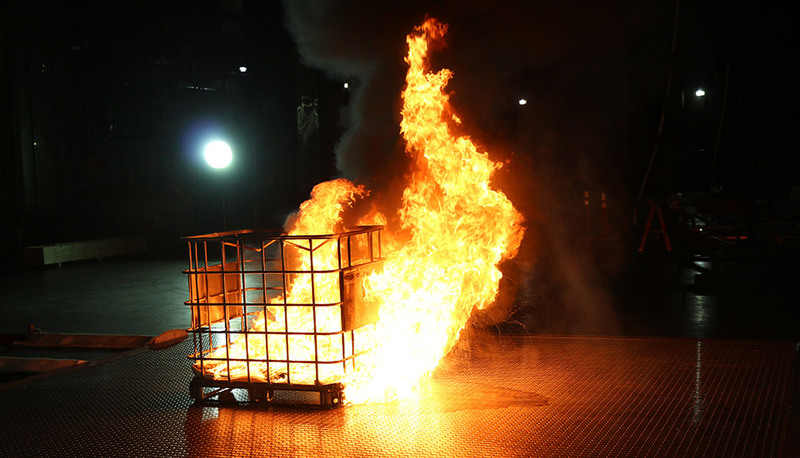 The test program was conducted in the Large Burn Laboratory at the FM Global Research Campus. Sienkiewicz managed the two-month-long research program and was joined at various times by engineers from Safespill and FM Approvals. He notes that the entire process took less than 18 months, including planning the program, obtaining product from the manufacturer, performance testing, transferring the results to FM Approvals, and the subsequent issuance of Approval Standard 6090. Diagram of flooring test apparatus. The liquid quickly flows through the perforated aluminum surface and into the cavity below the deck where it is carried away. While research testing was ongoing, Gould traveled to the Houston area to witness the manufacturing of the Safespill flooring system as part of the approval program. He developed the new Approval Standard 6090 based on the performance tests conducted on the Safespill flooring system as well as other tests to ensure that the standard can be applied to any other product submitted for approval testing. Approval Standard 6090 includes requirements for flooring assemblies that are part of an overall drainage system designed to prevent or minimize the consequences of an ignitable liquid pool fire or hazardous liquid spill in commercial or industrial facilities. The purpose of the standard is to determine the maximum spill flow rate that the floor assembly can handle; ensure that the assembly is leakproof; determine if the assembly will function whether or not the spilled liquid has been ignited; and that it can withstand the expected dead and live loads. 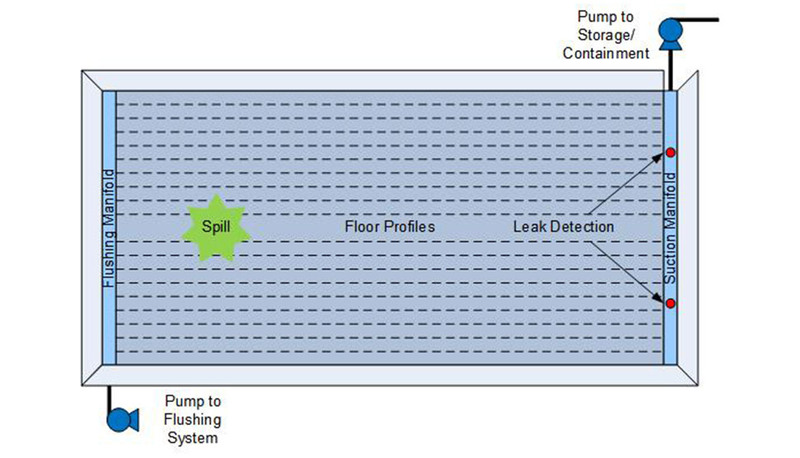 Drainage flow rate test – upon completion of this test, the flooring assembly will be assigned a total maximum flow rate based on the test results using a simulated spill. Survivability test – all liquid drainage floor assemblies will be evaluated to determine that the assembly can withstand a simulated ignitable liquid fire. At a minimum, two separate tests will be conducted using heptane as the ignition source. One test will be at a flow rate of 2 gpm (7.6 lpm) and a second test at a flow rate of 40 gpm (151 lpm). Each test will be conducted for a period of 20 minutes. Additional tests will be permitted using higher heptane flow rates if the system passes the first two tests. Structural analysis – all drainage floor assemblies will be subjected to an analysis to determine that the assembly will not fail when subjected to a total dead load and live load of 125 lbs/in2 (0.86 MPa). 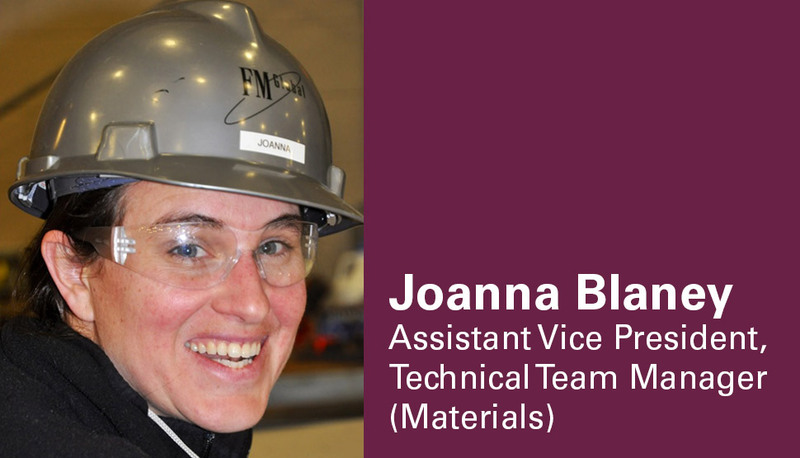 In addition, the manufacturer will be required to demonstrate a quality assurance program with specific controls for a range of product-related areas, including quality assurance testing, inspections, calibrations, change control and other elements. The manufacturing facility will be subject to initial and follow-up surveillance audits, installation inspections and other responsibilities. Mackintosh notes that the Safespill team is continuing to work with FM Global and FM Approvals on a higher capacity system intended for the storage of stacked IBCs. The new system will feature a higher flow rate floor system that can handle up to 800 gpm (3,028 lpm), and provide a turnkey pre-engineering solution. The current FM Approved Safespill floor assembly can handle up to 125 gpm (473 lpm) per 200 ft2 section. Multiple sections can be linked to cover larger areas. The flooring assembly can be used in many industrial applications where ignitable liquids or liquid chemicals are used in processes or handled in areas such as transfer stations, tote and drum filling areas, loading docks, and chemical staging or storage areas.